Feed efficiency, i.e., how well pigs can convert feed into growth, is determined by the right pig feeder trough design, and is one of the most important factors that influence pig production. Feed costs for commercial pig operations can account for up to two-thirds of the cost of production. In addition, recent research has shown the wrong size or design of pig feeder troughs can reduce daily feed intake of pigs, and thus impair the animal’s growth rate. The right design can increase growth, reduce feed cost, and impact how efficiently pigs’ access feed. The last thing you can afford is waste — whether from feed spillage on the ground, through the slats of the floor or from substandard feed efficiency. The largest impact on your feed cost and profit margin can be directly related to feed efficiency. Osborne Industries has been a leader in designing and manufacturing efficient, durable feeders to hog producers all over the world for over 30 years. Innovation and a “no waste” philosophy underline our success. We consider such factors in feeder design as feed presentation, space allocation for the pigs to consume the feed, storage capacity, and the availability of the feed at the trough and how it’s managed. Osborne’s line of Big Wheel Feeders have round troughs designed to provide fresh feed on demand for growing pigs in both indoor and outdoor applications. Big Wheel Feeders are the most efficient pig feeders made. They are designed and engineered to improve feed-to-gain ratios while radically reducing waste. The patented Big Wheel mechanical-flow design keeps pigs from overloading the feed trough, something that frequently happens with traditional gravity-flow feeders. Spatially, the round trough’s 360° access to feed allows for more standing-room and less physical contact while eating, which provides pigs with a less stressful eating experience. 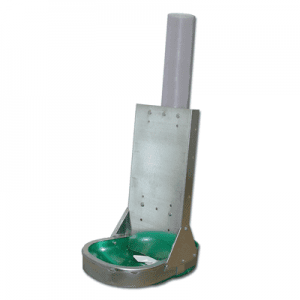 The self-cleaning round trough eliminates corners where feed can become stagnant and stale, and ensures fresh feed is always available for your pigs. Osborne’s stainless steel rectangular hog feeders include double-sided, wean-to-finish models available for dry or wet/dry feeding. Wet/dry feeders provide water access at the same time and location as the feed, allowing the pig to drink while consuming wet feed. Several studies have shown an increase in weight and feed intake over a shorter time using wet/dry feeding. Made with heavy, 16 gauge 304 stainless steel, the rectangular feeder is structurally sound with rolled edges and allows for deep head entry into the feed trough. Monitoring and adjusting the feeder is simple. Feeder adjustment influences growth rate more than feed efficiency, therefore, improperly adjusted feeders can limit consumption and reduce the growth rate of the pig. The trough’s solid divider panels with pre-drilled holes allow for splitting the feeder among sort and grower pens, while the pre-drilled holes and knockouts allow for mounting the feeders in multiple applications. 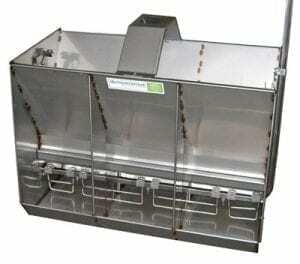 Osborne’s Ad-Lib Sow Feeders are designed for farrowing stalls or individual pens. They allow for maximum feed intake without waste. Feeding as much and as often as desired is necessary for lactating sows to maximize productivity. 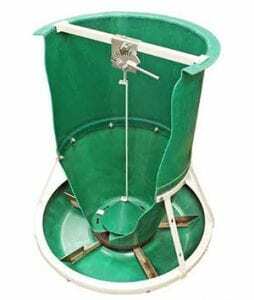 The proven mechanical-flow system of the Big Wheel family of ad-libitum lactation feeders make them work better for their purposes than any other feeders available. Virtually all feed disappearance can be equated to consumption, so your high performance animals always stay in top condition. Unlike Big Wheel sow feeders which are a complete feeding system, the Osborne Pivot Feeder™ is an economical option for applications where producers already have stainless steel troughs or bowls. The feeder easily bolts to existing bowls and readily accepts standard feed drop tubes. Osborne’s line of innovative feeders promote optimum feed efficiency, growth and reduce overall waste, allowing you to take your pigs from farrowing to market with equipment that produces the best results. If you’re in need of an efficient hog feeding solution, contact us today!